In March 2006, I joined a Yahoo quilting group, Stashbusters. The premise of this group is to "shop your stash" in order to use the wonderful fabric that you ALREADY own instead of continually buying more fabric. Since I already own more fabric than a lot of fabric stores (hanging head in shame), I thought this group might be a very good inspiration for me to use what I have. Just after I joined, one member, Helina in Finland, posted her own Chiclet quilt. It was gorgeous! Beautiful blues and browns in a thoughtful layout which caught my eye immediately. 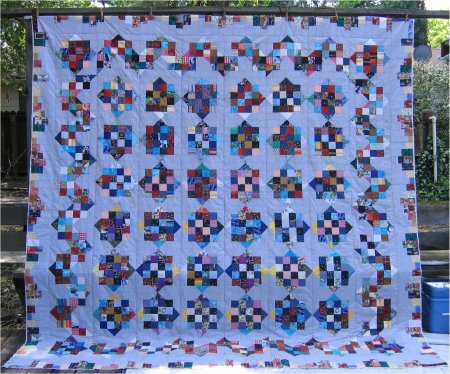 A picture of her quilt can be seen in her Quilts 2006 album, second page "Between Winter and Spring" quilt. I had never heard of the Chiclet quilt, but through the links of the Stashbusters, I discovered that it is a freely downloadable pattern, generously provided by Brandy's Quilts. The link is at the bottom of the first column. You might be familiar with the Chiclets gum .. very tiny squares of gum covered with a crunchy colorful coating ... this concept is what Brandy's quilt interprets. It was obvious to me that when Brandy drafted this pattern, she must have had tons (and tons and tons!) of 2-1/2" square hanging around from previous projects, as she uses those individual squares to construct her blocks. As much as I was intrigued by the idea of the Chiclet quilt, there was NO WAY I was going to make it with individual squares! Besides, my own scrapbaskets don't have a lot of squares ... my own quilting style is towards strip quilting. Therefore, it was easy enough to convert Brandy's individual square layout to using strip sets with the strips that I already had available. Brandy's quilt also featured a scrappy piano key border, which I realized was a wonderful way to use up MORE of those scraps! However, there was a very obvious difference between Helina's version and the original Chiclet's layout. Helina had drafted an incredibly dynamic variation of the basic block, which I have named a zig-zag Chiclet block. (Helina tells me that she used a block-of-the-month from Delaware quilts as inspiration for her Chiclet variation block). Helina used the zig-zag block as an outer border. The life and movement this block gives the quilt is enormous! While Brandy's original quilt is very nice, I must confess that I would have simply bookmarked it for a future project since I already have a HUGE (and I do mean *huge*) list of quilting projects and UFOs calling to me. When I saw Helina's zig-zag border, I was hooked! I downloaded Brandy's pattern and using Electric Quilt, I drafted the zig-zag Chiclet block. Using Electric Quilt is wonderful design tool to help tweak quilt layouts, colorations and estimate yardage. Since I have more than enough wall hanging sized quilts, I decided I would make my version as a bed sized quilt ... a supersized version of Helina's. As I was working on drafting the Electric Quilt project file, I remembered a book of borders I had ("Foundation Borders" by Jane Hall & Dixie Haywood ISBN 1-57432-801-8) and specifically, a bargello-style piano key border. I thought that this style border would make my quilt one more variation on a theme, instead of simply copying Brandy's piano key border or Helina's solid strip border. If you have Electric Quilt, you may download my project file. Be aware that Electric Quilt project files are layouts only! Directions for quilt construction are not included; instructions for assembly can be found at Brandy's webpage (link above). Brandy of Brandy's Quilts and Helinä Penttinen of Finland have graciously granted me permission for their respective blocks to be included in the project file. It took me one whole week to make all of the quilt blocks .. both the basic and zig-zag Chiclet blocks. Because it's a scrap quilt, it was difficult to estimate how much background fabric I would need and I quickly found out that the 3 yards of mottled gray fabric wasn't going to be enough. Fortunately, I had *just* bought it, so I hurried back to the store and bought 4 more for a total of 7 yards of background fabric. The rest of the Chiclet quilt, I am thorougly embarassed to admit, came ENTIRELY from my scrapbaskets. NOT my stash ... my *scrapbaskets*. Let me repeat this .... except for the background fabric that I bought for consistency, the ENTIRE KING SIZE quilt top was made from my SCRAPS. And just how big is this king-sized top? 108"x108". That's 3 yards by 3 yards. or 9 FEET by 9 FEET huge. OMG .. who knew a king-size quilt was that big? (disregard the fact that Electric Quilt already told me how big it was or that my many reference books told me how big it was .. you just can NOT appreciate how BIG this thing is until you actually see it). You think the story ends here, don't you? Well, nothing is ever that simple in my life. I have a list (created in my word processor for easy maintenance) of all my quilt projects, UFOs, and ideas. It has been my goal since 2003 to work mainly from my list to *finish* those projects, UFOs and ideas so that I am not so overwhelmed with what I have. Overall, I've been pretty good .. there have been emergency or short-term projects that got top priority for a while, but basically I've stuck with that list. I've been fairly consistent about resisting working on ideas from new books, magazines, websites and other patterns that I've seen. Until Chiclets. (sigh) Chiclets seemed so simple. Furthermore, I really didn't NEED a king-sized quilt, as Mr. Pirate & my bed has a down comforter on it .. not a quilt. BUT ... I *could* make a king-sized duvet cover from the Chiclets pattern! So, that was my goal ... a king-size duvet cover for my comforter. While it took me only about a week to finish all the component blocks, life got in the way and it took a few more weeks to get the blocks sewn together into a top. Now, when I make a duvet cover, I like to have the inside of the cover neat and tidy. To do this, I use the "sew-n-flip" technique of sewing the blocks onto a base faric. When finished, the inside has no seams or threads exposed. I bought 3-1/2 yards of 120" wide muslin for my base fabric and blocked out where the border would be. The Chiclet blocks were then sewn into columns and the columns were sewn with the 'sew-n-flip' technique onto the muslin. Well, that called for a glass of wine and some thinking. I could make the duvet cover as it was .... bigger than the comforter and no border. I didn't like this solution, because 1) it would be a sloppy fit and 2) doggone it! I liked the bargello-style piano key border! Upon further contemplation, I decided to heck with the duvet cover idea ... I'd just make a real quilt out of it. Unfortunately, it will be slightly heavier than normal due to the muslin base fabric that the blocks are sewn onto, but by golly, it sure will be stable! Once that decision had been made, I worked on the border. It took me until mid-April 2006 (a month and a half total time) to finish the quilt top but at least it's done. It'll be put on the list of quilt projects to wait its turn to be quilted.